This essay is part of a series that accompanies NCRC’s 2019 study on gentrification and cultural displacement. The opinions expressed in this article are the author’s own and do not necessarily reflect the views of NCRC. The primarily African American Jackson Ward neighborhood in Richmond, Virginia, has been swiftly gentrified. At the intersection of Second Street and East Jackson Street, historical aspects like Maggie Walker’s house and the Hippodrome Theater have been forgotten, as other areas have seen promising improvements. Overall, the changes to this community have been a mixed bag. Maggie Walker was one of the premier black business women of the early 20th Century, and the first American female bank president to charter a U.S. bank. The term “Quality Row” was used to describe the block that Maggie Walker and other “well-to-do black people” lived on in Jackson Ward. Jackson Ward was hailed as “The Harlem of the South”– and for good reason. It was the seat of black innovation, culture and business, and it was the first Richmond community built by blacks after the Civil War. 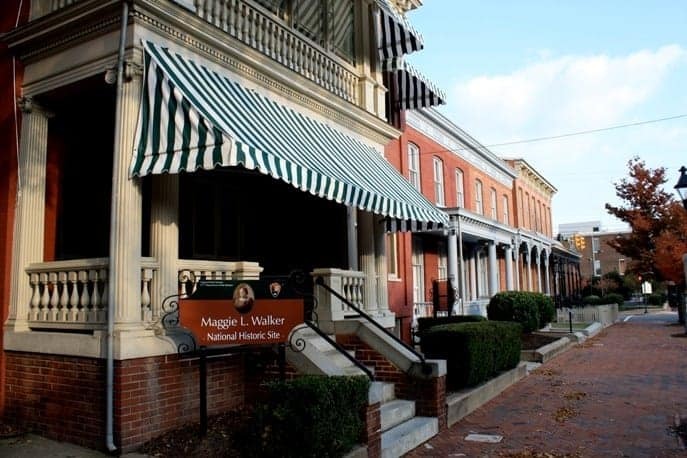 It was here that Maggie Walker founded the St. Luke’s Penny Savings Bank, one of the strongest and earliest black banks, providing capital access to black homeowners and entrepreneurs. Walker’s bank grew and became the Consolidated Bank and Trust Company which survived the Great Depression, and still operates as part of Premier Bank. Jackson Ward, being home to most of Richmond’s black population, meant it was a mixed-use, mixed-income community, full of diverse thought and powerful voices. Doctors, lawyers, small business owners, musicians, teachers, bank tellers and domestic workers lived and worked in the same community. This economic diversity created a neighborhood where people looked out for one another — if a child did something wrong outside their house, their parent would know by the time they got home. Jackson Ward was a place where people made a point of taking care of each other in a real way — if a neighbor needed medical care but could not afford it, they would get it from the community doctor who was more focused on his neighbors’ health than their ability to pay. People in this community looked out for each other, in part, because they only had one another to depend on. It’s ironic that Jackson Ward, with its deep historical association with black entrepreneurship, is being gentrified, and is one of the districts in Richmond experiencing black displacement. While many of us who have owned houses in this community have enjoyed the growing equity in our homes and beautification of our neighborhood, there are also downsides. According to the interactive map that is part of NCRC’s 2019 national study on gentrification and cultural displacement, between 2000 and 2010, median home value in Jackson Ward climbed more than $100,000. However, there are neighbors who can’t afford to buy into the transformation, which unfortunately means they have had to leave. Some 19 percent of the black population moved out during that same time frame. These neighbors, many of whom had made a significant investment in this community for many years, deserved to reap the same benefits that those of us who own or can afford to pay for the higher cost rentals are currently enjoying in Jackson Ward. Jackson Ward is an eclectic community. We benefit from neighbors who know the history of this community and from young students and families who have just moved in. We house businesses that have been here for generations, and people who are stepping out on a venture for the first time, hoping they will succeed. Today, the original site of the St. Luke’s Penny Savings Bank is being redeveloped into a mixed-use building. Hopefully, this redevelopment will reflect aspects of the cultural history and economic mix of Jackson Ward of the past. We have seen developers come in and build unaffordable housing that displaces our neighbors who possess rich and valued community history, a knowledge of how far we have come and an attentiveness to where we need to look back to gain wisdom for the future. We have seen restaurants come in and charge prices that many who live here don’t have access to. We, however, see glimpses of the old Jackson Ward when we see neighbors helping people stranded with a flat tire or lending their tools so that neighbors without sheds in their backyards can mow their small lawns. Lea Whitehurst-Gibson is Executive Director of Virginia Community Voice and lives in the Jackson Ward neighborhood in Richmond, Virginia. Bruce Mitchell is a Senior Researcher at NCRC.